The hijinks at recent Foo Fighters shows have included John Travolta making a cameo during a “You’re the One That I Want” cover and Grohl almost breaking his leg in the midst of rockstar guitar antics. 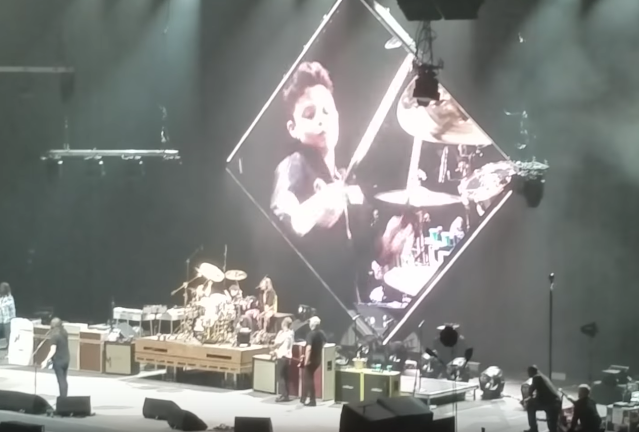 Now comes the troubling tale of “Little Fonzie,” a suspiciously monikered 8-year-old scamp allowed onto the stage at a Foo show in Nashville to play a drum solo last week. The invitation is part of an ongoing campaign at Foo shows to allow children to jam with them. Little Fonzie’s solo continued for roughly three minutes, even after a congratulatory handshake from Grohl failed to signal to the track-jacket-clad showboat that it was time to move on with the show. “Hey, Little Fonzie, can I have my concert back?” Grohl murmured at one point, called for LF’s father’s assistance. After the second leg of the solo, Grohl lured Little Fonzie off-stage with the promise of a Coke. You can decide for yourself whether Grohl’s dismissive treatment of the overzealous young man after he overstayed his welcome was callous or not; after all, he is courting this sort of behavior by repeatedly allowing child musicians to do whatever they want onstage with him. watch below.